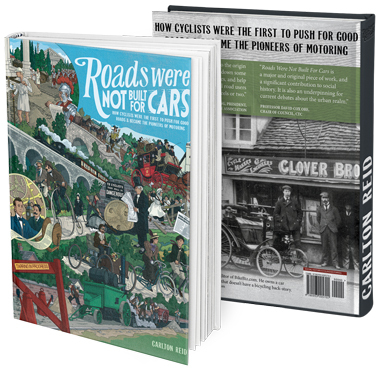 The first cycle paths in the UK were installed (badly) in the 1930s. However, the idea for such dedicated ways – segregated and swept, even – was first proposed in 1821. Given that what we would recognise as a bicycle wasn’t developed until the 1860s, such a proposal seems rather prescient. The proposal was made by Lewis Gompertz, an industrious inventor (thank him for the drill chuck bit), who also happened to be vegetarian and Jewish. His radical vegetarianism led him to campaign against the mistreatment of the animals that were at the heart Victorian street transport: horses. 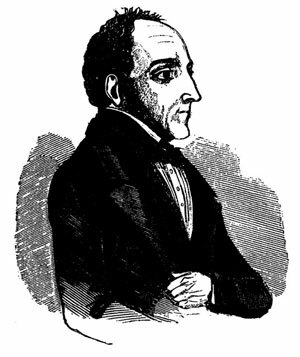 Gompertz was one of the co-founder’s of the Society for the Prevention of Cruelty to Animals, which later had the Royal added to the front, creating the RSPCA. He preferred walking to riding in a horse-pulled carriage and was therefore much taken with the German machine that meant ‘fast foot’ in Latin. The velocipede running machine – or hobbyhorse, a bicycle without cranks or pedals – was introduced to the world by Baron von Drais. He had created his contraption in 1817 as a horse-substitute because, it is now believed, the price of oats, and everything else, had soared after the planet was plunged into darkness after the volcanic eruption of Indonesia’s Mt. Tambora in 1815. 1816 was known as the Year Without a Summer. Horses starved because of lack of fodder. Later chronicles talk of “pferdesterben”, horse agony. American historian John D. Frost described the Year Without a Summer as “the last big subsistence crisis of mankind”. The addition failed to catch on. For Gompertz, the lack of interest in the two-wheel singletrack vehicle wasn’t due to poor vehicle design but to the surface upon which the vehicle was forced to run. Hobbyhorses, with their wooden wheels, were more usually urban runabouts, not long-distance machines. They were more suited to the smooth block-covered footways in towns rather than the small stone macadamised roads of the countryside. (In 1818, Britain had 114,379 miles of highways, of which 19,275 miles were turnpike roads, many of which were well-surfaced and carried ‘fast’ stagecoach traffic: 10mph was fast). 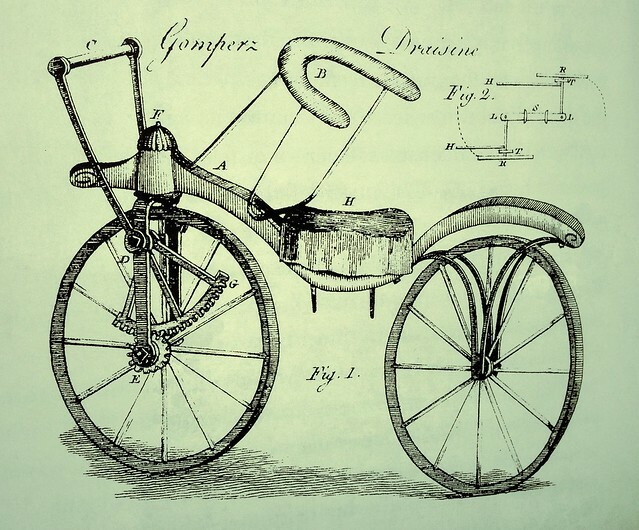 Thanks to Professor Dr Hans-Erhard Lessing for alerting me to Gompertz’ views on separated velocipede infrastructure, and to Les Bowerman for supplying a copy of ‘Addition to the Velocipede’ in the Register of Arts, Manufacture and Agriculture, 2nd series, no. CCXXIX, June 1821. Prof. Lessing’s views are in my view quite speculative, though the argument about the unusual global weather patterns does provide an interesting background of possible influences on social and technological history. What perhaps should be remembered is that the scale of production and use of the hobby-horse in 1820 was more limited than the amount of ‘noise’ that it made in the press now implies or suggests. The hobby-horse appears to have been essentially a rich man’s toy. The number of people who used the hobby-horse for practical, transportational purposes was infinitesimally small, compared to the work done by horses! For most users it was a recreational device. Therefore, I think it is perhaps overly ambitious to think of Gompertz’s comments here, merely the germ of an idea, as representing a serious proposal to actually implement a separated infrastructure. Had such a ‘hobby-horse path actually been constructed in England or Germany [the centres of hobby-horse production], it’s doubtful that there would have been enough users to justify its expense. But the fact Gompertz had such a view is interesting. Yes, it was a dandy toy and rarely used for genuine transportation but I checked with Roger Street and he told me of some longer journeys made by hobbyhorse, including some very very long ones. Clearly these were the exception, not the norm. Not to under-value the role of Drais andf English builders in understanding the balancing and steering potential of two wheels in line, of course!